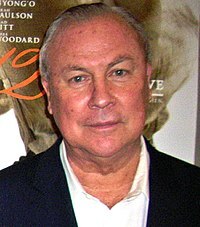 English: Robert Wilson (born 4 October 1941) is an American experimental theater stage director and playwright. Deutsch: Robert Wilson (* 4. Oktober 1941 in Waco, Texas) ist ein US-amerikanischer Regisseur, Theaterautor, Maler, Lichtdesigner, Bühnenbildner, Videokünstler und Architekt. Media in category "Robert Wilson (director)"
This page was last edited on 18 February 2019, at 11:46.